PC liberal culture preaches a radical individualism where one can ‘be normal, find happiness and be fulfilled’ without lifelong relationships, commitments, and obligation to social relationships and spiritual beliefs that transcend his singular self. We, in the post modern Western world, are in the midst of several social revolutions, and the ‘abdication (fleeing) from parenthood’ is the most significant and the most threatening. The first social revolution in our midst is the promotion of fluid, sexual gender identity, encouraging the development of sexual identities other than the traditional, two ‘male-female’ definitions. However, this revolution, though dramatic and influential, involves only 5-6% of the population. The second social revolution is the delegitimizing of the traditional, male-female family, and the legitimizing as ‘ normative families’ a variety of ‘patterns of household unit’ for the purpose of companionship, intimacy, homemaking and possibly parenthood. This revolution is very real, and the traditional two parent, two gender family model is now in danger of becoming a minority form of household organization. However the danger of the abandonment of the traditional two-parent family is somewhat mitigated by the fact that the new, alternative family models still provide their members with some kind of a socially supportive ‘roof over their heads’. The third revolution, that young people are simply choosing not to become parents, (or in the very limited manner of having only one child) is the most far reaching and most threatening of these social revolutions. Young people are beginning to see parenthood as a tentative option, and not as a natural imperative, or a moral obligation. Seeing parenthood only as an option is very threatening because it constitutes a radical re-understanding of ‘what it means to be a human being’. Also, civilizations that do not demographically reproduce themselves are ‘slowly committing suicide’ .Low fertility rates thus threaten the perpetuation of cultures that have been the main building blocks of human civilization. Needless to say our Torah is ‘not politically correct’. The Torah sees parenthood as a blessed, natural imperative, a moral obligation, the essence of what it means to be human, and essential for the perpetuation of the three thousand old civilization of Judaism. A recent survey reports that young millennial’s are fleeing from parenthood because 1) of the desire for more personal freedom and leisure time, 2) that they do not yet have a partner, 3) a sense of economic insecurity and the expense of child care and providing for the children’s needs, and 4) that parenthood interferes with career advancement and self actualization. However, these reasons have to be understood as the ‘symptoms’, and not the basic causes, for their fleeing from parenthood. There are two core reasons that young people today feel that being a parent is not an essential element in human self fulfillment. One, most of the past’s ‘utilitarian, self serving’ reasons for being married and raising a family no longer exist in today’s society. Two , on a deeper level, politically correct liberal culture preaches a radical individualism that teaches that a human being can ‘be normal, find happiness and fulfill himself’ without having lifelong relationships, commitments, and obligation to social relationships and spiritual beliefs that transcend his singular self. The entry of women into the workforce, and the feminist movement’s redefinition of womanhood, mean women no longer have to get married and build a family to attain economic security. Modern technology and consumerism mean that one need not spend much time at home in order to maintain a household. Contraception and the redefinition of sexual morality mean that people no longer need a marriage or family to experience physical intimacy. Finally growing affluence, and social welfare benefits, mean that one does not need the support of children in time of disability or advanced ageing. For these reasons, more and more young people are seeing that one can seemingly lead a normal, happy life without spouse or child. In fact a spouse or child may ‘get in the way’ .Familyhood, and parenthood, have become an option. But the real reason parenthood is an option is that the singular, subjective self has become the ‘king/queen’ in the post modern world. Post modern philosophers and academics teach that there are no objective, universal or eternal truths upon which humans can rely to construct their lives and social relationships. And if no objective truths exist outside myself (‘transcend my personal Being’), than I have no commanding, objective obligations or commitments with regard to the social relationships and groupings outside myself. I am obligated or committed only to the social relationships and groupings commanded by my subjective self. My subjective self is the only authority that can obligate or commit me. My subjective self is the only authority that can tell me how to best, most happily, fulfill or actualize my self. Postmodern society is rapidly becoming populated in a highly atomized fashion with individuals leading singular (sometimes lonely and isolated) lives, like ships passing each other in the ocean’s dark night. This reduction of social relationships to one’s subjective feelings is the core reason that the social relationships of millennials tend to be short term, transient, utilitarian and self serving. They tend to avoid long term commitments to institutionalized marriage, religion, highly structured social communities, and ethnic/national identity. Postmodern society is rapidly becoming populated in a highly atomized fashion with individuals leading singular (sometimes lonely and isolated) lives, like ships passing each other in the ocean’s dark night. We can now more deeply understand why millenials are running away from parenthood. By all counts, the essence of parenthood is the type of lifelong commitment, obligation and economic and personal self sacrifice that the millennials’ subjective self finds hard to accept. And they are ‘right’. Parenthood really does put many hindrances on a self centered path of self fulfillment and actualization. In contrast, the Torah definition of ‘self’ is a G-d oriented sense of self. G-d created the world and gave us life. |Based on this truth, Torah individualism thus means that a Jew finds self fulfillment by accepting the lifelong obligation and commitment to dialogue with, and engage in, G-d’s commandments. And parenthood is possibly the cornerstone of G-d’s commandments. Bringing human life into the world is G-d’s first commandment to mankind. Also, the commandment to learn Torah is based on the demand that a father teach his children Torah. In the Ten Commandments the fifth commandment to honor one’s parents is the commandment that ‘bridges’ between the first four G-d oriented commandments and the last five man oriented commandments. The Torah teaches that because G-d’s created all existence, and he gave the Torah to his chosen Jewish people, the act that most gives G-d pleasure is to see His world populated by Jews who teach their children to live a life of Torah. In this vein, getting up in the middle of night to nurse an infant, or to change a diaper, is truly an act of ‘social activism’. Working fewer hours at your career, with lesser income, in order to be home with your children and create a family atmosphere imbued with the happiness of G-d’s commandments is the greatest act of ‘tikun olam’-social justice that a Jew can perform. For politically correct liberal millenials parenthood has become a ‘possible option’-and not a moral obligation- on the way to singular, subjective self fulfillment. 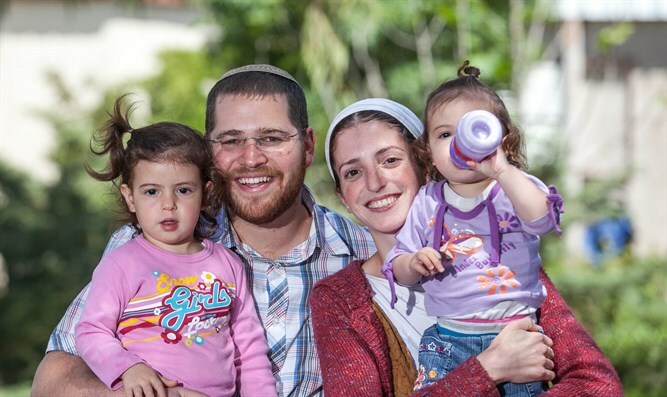 For the Torah Jew parenthood –creating a family living a life of Torah and thus enriching and building the Jewish people- is the most powerful act of social justice and tikun olam that they can do. The most convincing statistic that dramatically portrays the difference between politically correct and Torah parenthood is this: throughout the entire modern world, higher education and gender equality in employment strongly correlate with lower fertility, bringing fewer children into the world. The only exception to this correlation is the Israeli national religious community. National religious mothers are the only sub-population in the world where higher education and employment still correlate with large families. Such is the way of the Torah.